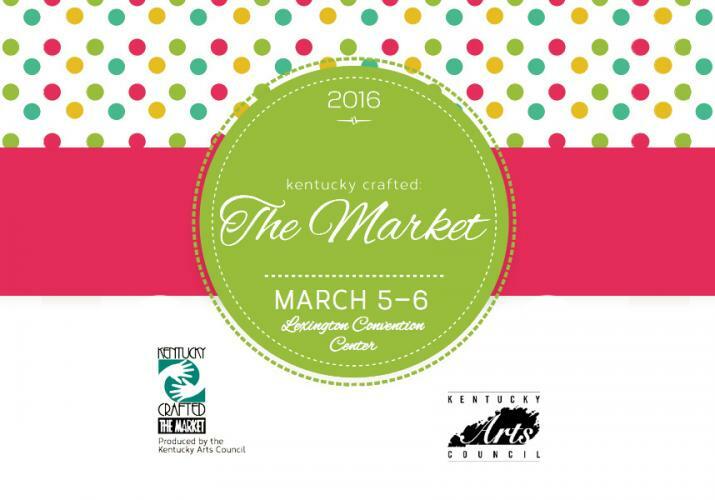 Kentucky art, craft, literature, music and artisan food will return to the Lexington Convention Center in March 2016 for the 34th edition of Kentucky Crafted: The Market, the Kentucky Arts Council’s signature arts event for wholesale buyers and the general public. The Market will be March 5th - 6th at the Lexington Convention Center, 430 West Vine Street in Lexington. It will be open to registered wholesale buyers only on March 4th. Kentucky is one of few states in the nation to sponsor a show of this kind for its art and craft businesses. The Southeast Tourism Society has named it a Top 20 Event for more than 15 years. Kentucky artists who exhibit at The Market are all juried participants in the arts council’s Kentucky Crafted Program and represent a broad cross-section of artistic disciplines. In addition, select artists from other states are invited to exhibit at the show. The Market, a nationally recognized show, serves as the No. 1 destination for wholesale buyers who are interested in purchasing Kentucky art and craft for resale. Market visitors will see paintings, sketches, wood carvings, unique furniture, sculpture, metalwork, literature, music and many other examples of art and craft made by artists in the Kentucky Crafted program and selected out-of-state artists. A variety of Kentucky Proud food vendors will also sell their culinary creations. The Market also features performances by 16 of Kentucky’s top music groups on the Kentucky Stage. Take a break from shopping at the artists’ booths, sit down and enjoy the sounds of bluegrass, blues, jazz and other distinctive Kentucky sounds from performing groups in the arts council’s Performing Artists Directory. For bluegrass fans, the Kentucky Stage will feature a solid block of bluegrass music on Saturday afternoon from musicians and groups like Dale Pyatt, No Tools Loaned and Hog Operation. The Market will be open to the public 9am - 7pm Saturday, March 5th and 10am - 5pm Sunday, March 6th. Tickets are $10 for one day and $15 for both days, and can be purchased online (https://secure.kentucky.gov/formservices/Arts/CraftedTickets) or at the door. Children 15 years of age and under are admitted free with a paying adult.